Cedar Rapids - The Cedar Rapids River Kings lost the front end of a two-week doubleheader to the Iowa Barnstormers 41-20 at the US Cellular Center Saturday night. The Barnstormers stay undefeated on the season at 4-0 while the River Kings fall to 1-4. Iowa quarterback Daquan Neal scored his teams’ first three touchdowns, all on the ground. Rushes of six, one, and 13 all capped off Barnstormer rushing drives through the first three quarters. Wide receiver Ryan Balentine caught a three yard pass from Daquan for Iowa’s final score of the evening. Cedar Rapids quarterback Kurt Palandech’s lone touchdown throw came in the second quarter, when Drake White caught an 8 yard throw that was tipped by a Barnstormer defender. The River Kings QB had a number of impressive runs on the night, earning 50 yards on 10 attempts. Palandech led the team in rushing, while running back Nate Chavious finished the night with 32 yards on seven carries. Defensively the River Kings forced one Barnstormer fumble that Iowa recovered. Nick Brassell lead the team in tackles with nine total and seven solos. Damante Horton came away with six eight total tackles including six solo. Going into halftime, the River Kings trailed just 17-10, with both teams nearly equal in all statistical categories. Iowa rushed the ball 11 times for 28 yards, while Cedar Rapids rushed 10 times for 37 yards. Iowa quarterback Neal was 9-11 for 90 yards, while Palandech was 7-10 for 66 yards and a touchdown. The River Kings had a tough time stopping Iowa receiver Ryan Balentine, who had five catches for 56 yards. His teammate Coll Hollenbeck had three catches for 23 yards through the first two quarters as well. Palandech spread the ball around nearly evenly, giving Chavious, White, and Smith two catches each. Wade added one for his only action of the first half. In the backend of the doubleheader, both teams are in action against each other in Des Moines next Saturday. 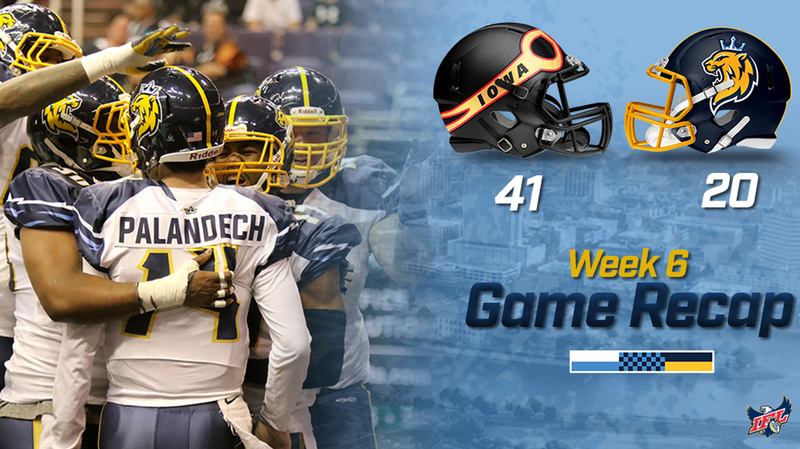 The game kicks off at 7:05PM from the Wells Fargo Arena and can be live streamed on the IFL’s YouTube page.